I remember the night so clearly. It was the end of an emotionally exhausting day. My husband and I were lying in bed, holding hands, feeling like it was the only thing we had to hold on to. He sighed and said, “The life that I am living doesn’t seem like mine. Everything we are going through seems like something that happens to someone else, not us.” I could not argue with him, he was right. We were watching much of our life around us crumble and there was not much we could do to prevent it. We had to wait until the crumbling stopped and we could re-build. Our family was experiencing hardships of almost every kind. We had to move from our home, close a business, and we had nowhere to live. The foster child we were in the process of adopting mentally went off the deep end. For the physical safety of our family, we immediately moved him out, and this caused more legal and emotional trauma than we could have imagined. One of our cars died; it was not worth fixing. A friend loaned us an extra vehicle he had. We stayed at my sister’s home until we could find a place to rent. Moving to a new area where we didn’t know anyone was just another stress. Our other car was beginning to have problems. Our savings were low. We were living paycheck to paycheck and our food storage was almost depleted. Some of the chaos was our fault. We did not prepare as much as we thought we had or think some decisions through completely. The other chaos was called life. We had no control over the economy, other people and their actions, nature, or health issues. Even thinking about that time brings back some of the overwhelming feelings we had. Our family was working on getting our footing first, then rebuilding our emergency supplies. We learned many difficult and painful lessons along the way, and we came out of it much smarter and stronger than we could have imagined. Life will always throw us curve balls, but we are more prepared to handle them now. As a family we have become the “better prepper”. 1) You can never have too much money saved. There will always be something unexpected come up, and it will come up at the worst time, always. We kept a mason jar around for loose change. I remember using it to buy $85 of groceries. As things got better, we worked our way up to a dollar jar. We were surprised to see how fast the jars filled up. Those jars were what helped us build up our emergency money. They are still in use and are a reminder to keep change and cash on hand. Not only in our home, but also in our bug out bags and cars. To raise additional funds, we sold items we did not need. We started cleaning out what we had and decided what we could live without. At the time, it was difficult to see some things go. Knowing that we were doing everything we could eased some of the pain. It was a few years later that I heard Dave Ramsey on the radio. Being prepared means having a healthy savings account and we decided to try his baby steps plan. That was the beginning of the way we now handle our finances. Go over your finances and make certain you have enough to get you through an emergency. Print out my collection of tracking charts at this link. 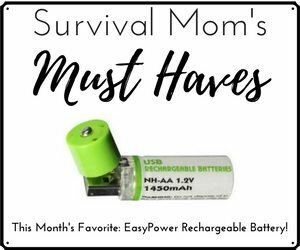 Join Survival Mom’s 52 Weeks Savings Club on Facebook. We’re over 3600 members and going strong! 2) Have 3 months of food stored. Money was tight and we ate our food storage. Our meals were inexpensive and home-cooked. Everything was used, nothing was thrown out. Soups were made with left over vegetables, meat was stretched by putting it in casseroles and salads. Knowing how to prepare nutritious meals from scratch was a skill I possessed, but had taken for granted. To supplement our food storage, I took advantage of additional opportunities. Many communities have some type of food co-op program where food is exchanged for volunteering hours or food is deeply discounted. The local university offered in-season produce grown by the students at $90 a year. My husband put in a small garden of tomatoes, lettuce, squash and bell peppers. Our neighbor was more than happy to give us oranges and lemons from her trees. Lemons were prepped and kept in the freezer for future meals. 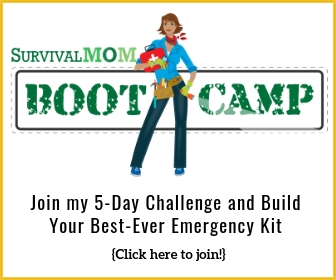 DON’T MISS THIS: Survival Mom’s guide, “Simple Food Storage Meals“. As things improved and finances allowed, we purchased meat and canned goods that were on sale. Our 3 month food supply of food, water, and everyday living supplies was built up a few items at a time. Nothing causes you to evaluate your food storage than having to use it. Store food you are going to eat and enjoy. This includes cake mix! 3) Education: I attended the local adult education school. After only a few months I was employed as a certified nursing assistant. A few months later I was a certified EKG technician. 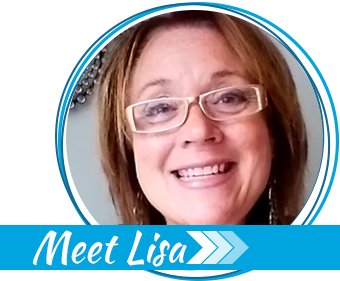 This experience slowly morphed into a small business. Being self-employed allowed me to make good money and go back to school for my BA. I knew I did not want to do this type of work as a career, but I do not regret the certifications. 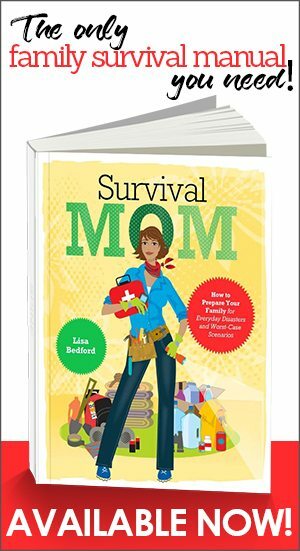 Being a prepper, I understood that it was an education that could someday benefit my family and others. Always look for ways to increase your education and preparation. It could be an Amateur Radio license class, CERT classes, and local adult education or community classes. Adding other streams of income is the key. 4) If full time employment is not possible, look for a short term solution. Something as simple as a dog-walking, house-sitting, substitute teaching, or other temporary jobs can get you through a rough patch. If you already have a full time job, look for other part time income streams. Is there a skill or hobby that you teach to others? What knowledge or experiences do you possess that can be turned into a small business? Even though we did not go through a natural disaster or suffer extreme trauma, we still experienced a large amount of stress. Stress takes a great toll on your body. Glucose levels and blood pressure can increase. Our immune systems can take a hit, making you at risk for auto-immune and cardiac disorders. To off-set the negative impact of the stress, our family focused on cutting out processed foods and switched to a whole food diet. We spent time walking, swimming and hiking outdoors. Mental health is sometimes overlooked in the prepper world. 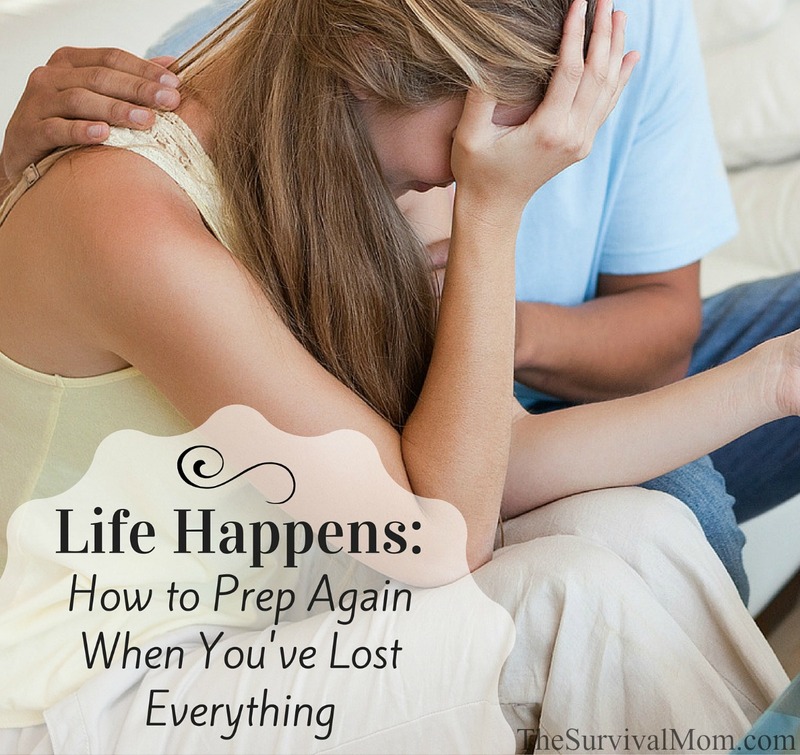 The pressure of trying to put life back together can be overwhelming. The effort used to get through or get by can push aside feelings of anxiety or depression. Sundays have always been used as a day to decompress for our family. When there were times of difficulty, we focused even more on keeping Sunday low-key. We attended church and did not obligate ourselves to anything else. We read books, watched uplifting movies, played games together and rested. This down time allowed us to face the next week with a renewed attitude. Along with family time, my husband and I continued to have our weekly date night. Since there was not much money, we could often be found having a picnic at a park or attending free activities in town. Maintaining strong and healthy relationships is part of being prepared. Two people, or a family of more, can work together and get through trying times if their family has trust and communication between each other. We are a religious family, it is part of who we are and it is our family culture’s main ingredient. During the good and bad times, we pray. This simple act has sustained us, and has given us the strength to get through difficult times. It has also given us hope that things will get better and that we are not alone in this journey. Prayer holds us accountable. When I pray for guidance, I am reminded that I need to be doing my part. Am I a wise steward with my money, time and resources? Prayer helps put things in their proper prospective and reminds us of the blessings we have been given. For those who are not religious, it is important to take time meditate or connect with one’s self. There is much to be thankful for, even in trying times. Center yourself and be open to opportunities and possibilities. Great ideas and solutions can come when the world is quiet and we are alone. Write down any ideas, even if they sound a bit crazy. They can transform into brilliant ideas. Through all of this, we were able rebuild our food storage, savings and emergency supplies. Our financial situation was good, and education and jobs were going well. Life was to be going great! And then another curve ball was thrown. My husband’s employer was replacing all management employees. We had a little bit of notice, but not as much as one would hope. After a brief moment of panic, we realized that we were going to be okay. Together we had been through such challenging times, this did not seem as difficult. Because of the experiences we had many years earlier, we were better prepared. During those four months of unemployment, we adopted a daughter, celebrated Thanksgiving and Christmas, witnessed our son’s wedding, had a beautiful reception on a shoestring budget, and prepped two kids leaving for college. We were able to enjoy all of the happy family events because we were prepared. I have a question I have wanted answered for a long time. The question is simple… what is the purpose of having a 52 week savings if the economy goes belly up? I mean if the money ends up worthless what did we save for? Yes, that’s the answer I was going to give. The economy is unpredictable. Honestly, it could stagger along like this indefinitely. Look at Japan and its lost decades. Because you’re not actually saving towards the possible crash of Wall Street. You’re saving because if you lose your job, it’ll take a minimum of 3-6 months to find a new one in your chosen field. You don’t always have warning that the company is being sold. Maybe the owner dies unexpectedly and his heirs don’t want it. The local burger joint is hiring shift work at minimum wage, but jobs for skilled laborers are scarce. If your house burns down, it will take weeks for the insurance company to settle. Where will you stay in the mean time? Not everyone has relatives willing to take them in for any length of time. You’re on your way to your pre-paid, non-refundable dream vacation and your car is totalled. Can you continue the trip and enjoy yourself? How do you get back home? 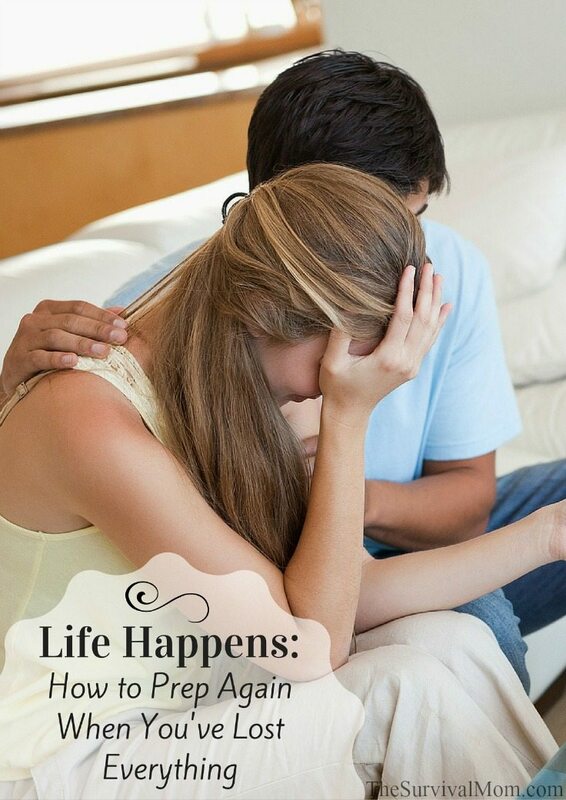 Your spouse or a child is hospitalized with an unexpected health condition. Insurance might cover the bulk of it, but how to do you cover the gas, food, lost wages, and possible hotel stays while they’re in treatment? Having money set aside to cover a year’s worth of expenses is just a buffer against what everyday life throws at you. We cannot predict what the economy will do, what will happen to the value of money, if our job is recession proof, our health or what disaster could happen. What money does is solve some problems and can buy you time. When my husband was out of work, we knew that we had unemployment for to lean on for awhile. We slept a little bit better knowing that we had time to figure things out. Our van needed a new tire. It wasn’t as stressful as it could have been if we didn’t have the money in savings. (Yes, we were still bummed!) I have never met anyone or have heard of any situation where people were sorry they saved money of any amount. It is important to not over think and get paralyzed by the “what if’s”. Any amount of money set aside, even hidden in your home can be a life saver! here is the thing John. There is no guarantee that the economy will go belly up. There is no guarantee that there will be a SHTF scenario. I will guarantee that at some point you will need emergency money and that at some point you will get old and will not be able to work and will need money. Saving and investing is just another form of prepping though some don’t see it that way. I like to bet on sure things. I pay in bills to get the change. I do this because when the money is worthless, the coin will be an easily recognized and adapted medium of exchange; easier than bartering eggs (or whatever) and especially useful in neighbor-to-neighbor economies. Thank you for sharing this with us. Even though we have big debt we still have our own reserve. Like one advisor told us “Pay yourself first. And have some savings.” So we do. The US money works worldwide. I’ve seen it. It will always have value. Save all your change if you cannot discipline yourself to save dollars. While you believe that US money works worldwide and will always have value I do not believe that to be true. 23 countries (60% of the world’s GDP) are setting up swap lines which bypass the dollar and SWIFT, which is the dollar-based worldwide financial transaction system. The true debt the US has is, at last count, around 17 trillion US dollars. We as a nation can not ever hope to pay this off and the only other thing to do is default on our payments. The end is a lot closer than we think as a results of this. All I can say is take a good look at what is happening to the once great republic we call America and decide what is best for you and your family. Our politicians in congress have turned their backs on the people that sent them to Wash. DC to do what is best for America and we aren’t seeing it happen. As a matter of fact we see just the opposite happening from the clowns in DC. I’m not sure how long this 52 week savings will last or what good it will do, but I plan on using it and the sooner the better. I thank all the people that took the time to answer my question and to this site for the chance to ask the question. I do hope each and everyone of you survive the coming bad times this great nation will go thru in the not so distant future. Thanks for the comment, John. I believe you are right on. I also agree with you, John. It’s coming. The only thing I can suggest is use that savings for a small piece of woodland for a hiding place, if needed, & maybe a few $ worth of junk silver, which should always be worth something. Or things to barter.